I became best friends with a PERSON. I fell in love with a PERSON. My name is Sara Singer and my partner's name will soon officially be Sophia Singer. I am Bisexual and she has just begun her MtF transition. We met years ago in the midwest and became best friends as Sara and Tony. I had no idea why he was rollercoastering between severe depression and serious alcoholism, but I wanted to be there to help. About 2 years later I told him that I was packing up and moving across the country to Las Vegas. He decided that he wanted to give up everything to come with me, but he wanted more than friendship. Those were easy terms for me. It wasn't until we had been living together for over a year and I had come home early from work one evening that everything changed. I actually thought he had a girl hiding in our apartment and I was taking off my earrings and my suit jacket ready to fight! Turns out HE was the GIRL in our apartment... That was the moment that everything and nothing changed at the same time. Standing there in her dress, so vulnerable I had to assure her that the packaging didn't matter to me. I became best friends with a PERSON. I fell in LOVE with a PERSON. That wasn't going to change. I can't sit here and act like we haven't had struggles. We have. But we still get through them the same way: Together. She is the beauty in my world and I wouldn't change a thing. Soon she will officially become Sophia Singer. Not just because we have started the physical changes like hormones and not just because she will be able to do a name change. It's because I am going to make her my wife. 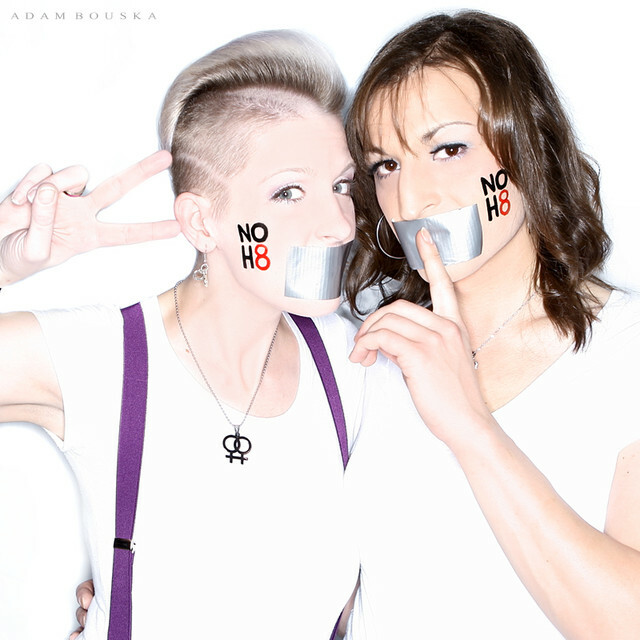 Campaigns like NOH8 help people like us come together, find support and feel less alone. So please don't stop. It was such an amazing experience for us. Thank you for being there for couples and people like us. She needs support now more than ever since she has started the process of officially coming out publicly and at her workplace. We would like to thank the people at NOH8 for allowing us to participate and supporting our community in such a public and positive way.